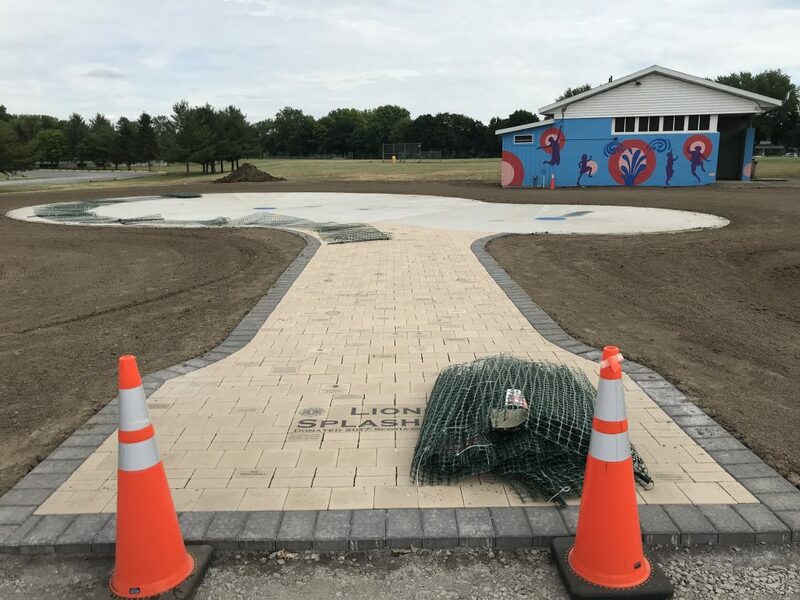 June 23, 2018: The Splash Pad area is now graded and dressed with top soil in preparation for sod on Monday. Trees, picnic tables and benches will follow soon. June 7, 2018: Concrete forms removed showing the great job the crew did. June 6, 2018: Concrete gets poured. It took 5 trucks to bring in the 47 yards of concrete needed for the pour. The crew used a concrete pumper truck to precisely place the concrete around the splash pad. 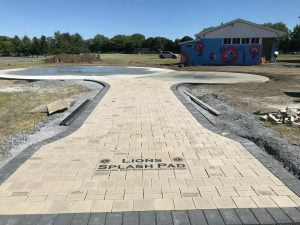 May 30, 2018: The splash pad is now ready for concrete. The piping, spray heads and compacted gravel base are installed. The concrete forms are starting to be installed. May 15, 2018: Piping and spray heads getting installed. The spray heads are anchored to small foundations. They will be adjusted to the right height before pouring concrete. April 23, 2018: Construction starts again. Excavation is complete and installation of spray heads and drains start. May 20, 2017: Volunteer work day. Nine people came out to help with the Splash Pad. We assembled 8 picnic tables and worked on completing the pump house roof and trim. May 8, 2017: Splash Pad moving along well. The plumbing is buried in crushed stone and you can see the water nozzles surrounding the blue drains. The pump house has some framing up. April 29, 2017: Splash Pad starts to take shape. The pump house foundation is poured. Nov 2016 through April 2017: Fundraising efforts underway. The Splash Pad is the largest project in the club’s history. There was lots of promoting the project at various community events. We did the Club’s first ever Car Raffle. Nov 2016: The site for the Splash Pad was initially an empty field next to the bathrooms. The beach is off to the right with the future Splash Pad site straight ahead.